After hearing a bunch of people talk about open water swimming at Bountiful Lake, I finally decided to try it out this morning. I met my brother, Jake, and Gordon Gridley at the lake just after 6:00am. The water at Bountiful Lake was surprisingly warm, about 78 degrees, and I would recommend that you not wear a wetsuit when swimming here at this time of the year. I have heard a few comments about the lake from other people online. Some said that there were too many fishers, that the water was dirty, and some expressed concerns about the lake being so close to the sewer treatment plant. That's why I was a little surprised when I got there. The area was well maintained and clean and there were even bathrooms near where we started. The water tasted a little like dirt, but after the first lap I didn't even notice. There were a few fishers, but they showed up after we had already swam one lap and they were mostly all near the boat ramp. Visibility was pretty typical of most open water venues that I have been to in the state: slightly murky with visibility of about 2 to 3 feet. 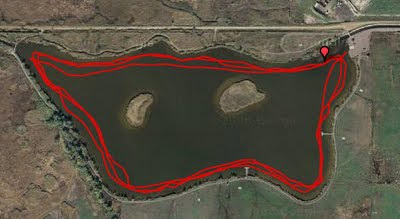 The lake is just over one mile in circumference, which makes it easy to figure out how far you have gone. We swam one lap with Gordon out in front and my brother and I trying to keep up. The first lap went well and by the end of the lap I was beginning to feel warmed up and ready for a couple more. Jake got out at this point, having just done a swim work out at the rec center the night before. We had such a good time that we are planning on swimming here on Wednesday mornings at 6:00 am. If anyone is interested in joining us, you are more than welcome. At that time of the morning there is little traffic from Salt Lake and it took me about 30 minutes to drive there from Sugarhouse. Another bonus is that there is no fee to swim...just park your car and get in.